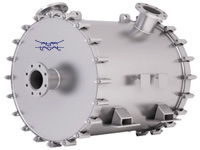 Alfa Laval is one of the world’s leading suppliers of heat exchangers. 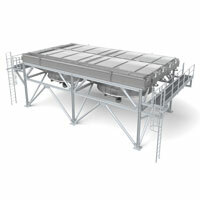 We offer a wide range of solutions for all types of heat transfer duties in petrochemical plants. Our products are found in a variety of plants, both in process and utility positions. We offer an unrivalled range of models, sizes and materials – everything from the world’s largest plate heat exchanger to our extremely corrosion resistant graphite heat exchangers. 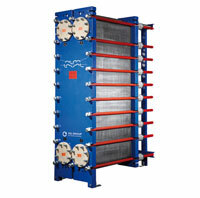 Compabloc is a fully welded plate heat exchanger with great flexibility and high efficiency. All-welded yet fully accessible for cleaning, it can be used as a liquid-to-liquid exchanger, interchanger, reboiler, condenser, evaporator or steam heater. With no gaskets between the plates, Compabloc is perfect for operation in chemically aggressive environments and for handling high temperature media at pressures up to 42 bar. Very low pressure drop, exceptional compactness and a self-cleaning design make Alfa Laval spiral heat exchangers extremely versatile. 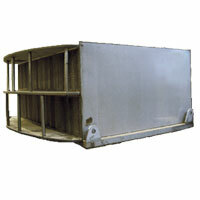 They are ideal for handling highly fouling fluids and for high vacuum condensation. Easy access to all heat transfer surfaces and high resistance to fouling keep maintenance costs low. Alfa Laval Packinox is the largest type of plate heat exchanger in the world. Each unit is tailor made to its specific application and they excel at heat recovery duties involving very long temperature programs, high throughputs, high temperatures and pressures. Alfa Laval Packinox heat exchangers can handle heat duties up to 100 MW in a single unit and have heat transfer areas up to 20,000 m2. Alfa Laval DuroShell is a specially engineered plate-and-shell heat exchanger for demanding duties. A unique internal construction, whose features include a patented roller coaster plate pattern and strengthening distribution tubes that run through the plate pack, makes DuroShell highly resistant to thermal and pressure fatigue. It also minimizes fouling, which means long intervals between cleanings and increased time in operation. This ensures higher performance over time. The counter-current, highly turbulent flow gives these compact units outstanding thermal efficiency. The plate-and-frame design means they can easily be expanded and gives service personnel full access to all heat-transfer surfaces, keeping investment and maintenance costs low. A wide range of plate and gasket materials are available to match the media. The semi-welded range features welded channels for one of the streams and gasketed channels for the other, combining the benefits of both welded and gasketed heat exchangers. Alfa Laval double-wall plate heat exchangers are ideal for use with fluids that must not mix because of environmental effects, deterioration of process fluids or because it would be hazardous. In case of a leak, the fluid will flow out of the heat exchanger instead of being mixed with the second stream, making detection of leakages fast and easy. 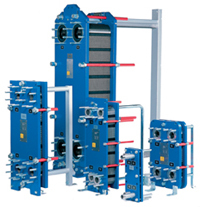 The Diabon range consists of plate-and-frame heat exchangers with graphite plates. They are designed for highly corrosive applications and are suitable for positions where full access to the plates is required. Diabon® plate heat exchangers are more efficient than traditional graphite blocks. AlfaNova is a gasket-free, 100% stainless steel heat exchanger that uses a unique, patented fusion bonding technology to seal the heat exchanger channels. AlfaNova is ideal for high-pressure, high-temperature tasks and where the medium is incompatible with gaskets. 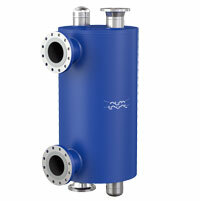 Alfa Laval offers a range of air-cooled heat exchangers suitable for both process and utility applications. They are fully customised and designed for demanding duties where high reliability is crucial. The combination of robust design and high-quality welding results in a product that can handle tough conditions without failing. Wet Surface Air Coolers (WSAC) are closed-loop, evaporative cooling systems used in liquid cooling, single phase gas cooling and turbine exhaust vacuum steam condensing applications. WSAC is optimized for industrial applications where rugged, durable designs and cost-effective, efficient closed-loop cooling and condensing duties are required. 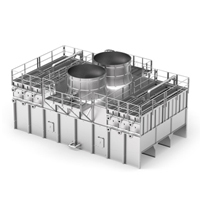 Each WSAC cooler or condenser is custom-designed to fit the specific application, and are tailored to meet the unique needs of the most demanding applications. Ziepack is a fully customized, welded hybrid type of heat exchanger. It combines the advantages of conventional shell-and-tube and plate heat exchangers. Ziepack features the same high heat transfer efficiency as a plate heat exchanger and has a process-stream pressure drop of just a few millibars, making it ideal for vacuum condensation and for heat recovery from flue gases. Ziepack can also be used as stab-in reboiler to improve energy efficiency of existing stab-in shell-and-tubes.